Thre weeks have passed since the 9.0 magnitude earthquake and tsunami struck Japan, which was then followed by the crisis at the Fukushima Daiichi nuclear power plant in northern Japan. As recovery efforts in the affected areas continue, radiation has contaminated water and soil in Japan, and possibly beyond. This is a developing story, and there are still more questions than answers as to the environmental impact of the crisis. In the meantime, animal rescue groups are on the ground in Japan, trying to rescue as many animals as they can. One of the biggest challenges rescuers are facing is re-uniting pets with their owners. As The Cat’s Meow blog reports, most shelters don’t allow pets, and pet owners were often faced with making a horrible choice between evacuating and leaving their pets behind, or staying in unsafe homes. 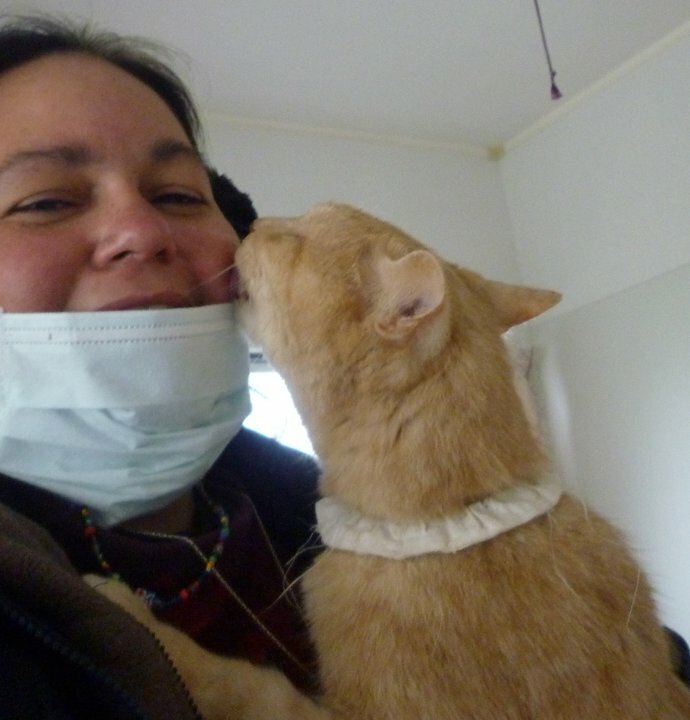 Tamae Morino brought her Persian-mix cat, Lady, to Fukushima city’s main shelter , but Lady is forced to stay outside. Like many of the animal victims of the earthquake and tsunami, Lady is frightened and agitated, and it’s been difficult for her to cope with the sudden change in environment. Thanks to the dedicated work of volunteers from rescue groups in Japan and from around the world, there are a few happy stories in the midst of all this devastation. Japan Earthquake Animal Rescue and Support posts daily updates of their rescue efforts, chronicling both challenges and successes, on their Facebook page. You can also follow them on Twitter. The American Veterinary Medical Association (AVMA) posted a comprehensive FAQ for pet owners about the earthquake in Japan on their website. And what about the cats and people on Cat Island? Conscious Cat reader Paula has been in touch with several people in Japan, and based on what she’s hearing, the cats and people on the island are okay. According to an e-mail Paula received from a Japanese journalist, the damage in Tashiro was not as big as it was in other parts of Honshu. They had a 16 to 20 foot high wave, and the buildings closest to the port were destroyed. Sadly, some cats near the port were killed, but the rest are fine and are being taken care of by people, just like before the quake. According to the journalist, the Japanese defense forces and the US military have been flying food and supplies, including cat food, to the island. Photo source: JEARS Facebook page. This photo was taken in a small shelter in Sendai. The building was water damaged, and there were overturned cars and debris everywhere. Miraculously, the 60+ cats inside were all okay. That´s mostly fantastic news. We got to think of the positive things and the cats and dogs that have been and are being rescued, because mostly people only think of the animals that died…. I’ll keep trying to find some good news in the middle of this tragedy, Barbarella. Thankfully, there is at least some. Over the years, I have taught myself to always see the positive side in everything. Because if you care to look for it, there always *is* positive stuff, even though the bad stuff appears so much worse! I see all these wonderful people going round helping the animals and humans and rescuing cats and dogs and people in the wake of this disaster. It´s the only way to cope with life, because if if you let yourself wallow in the sad and awful, you will just cry and get so depressed and probably won´t have the energy or will to do anything – and I´ve been there, done that, and would rather now be positive and help where I can (if I can, that is) and do something about it.- Sadly, a donation is all I can do from this end of the World… wish I was there to help physically! It is so good to hear good stories. I heard on the news yesterday about a dog that had been on a roof that was floating around ever since the earthquake hit. And they rescued him. Does my heart good to hear all these great stories. Marg, wasn’t that video of the dog being rescued wonderful? There’s so much bad news coming out of Japan, I think it’s important to highlight the good news, too, even if it’s few and far between. I cried when I watched this. It is so saddening, what happened. She must have been very happy to see her kitty was alive. I truly feel for those that lost their pets in this disaster. I know how I would feel if I lost my precious kitty. I hope and pray that many more people are as lucky as she is, and soon find their beloved animal family members and friends. I, too, hope that there are more happy reunion stories like this one, Linda. I can’t even imagine what these people, and the animals, are going through.